Chicago Review Press, 9780915864126, 304pp. Martin Luther King Jr. was a cautious nineteen-year-old rookie preacher when he left Atlanta, Georgia, to attend divinity school up north. At Crozer Theological Seminary, King, or “ML” back then, immediately found himself surrounded by a white staff and white professors. Even his dorm room had once been used by wounded Confederate soldiers during the Civil War. In addition, his fellow seminarians were almost all older; some were soldiers who had fought in World War II, others pacifists who had chosen jail instead of enlisting. ML was facing challenges he’d barely dreamed of. A prankster and a late-night, chain-smoking pool player, ML soon fell in love with a white woman, all the while adjusting to life in an integrated student body and facing discrimination from locals in the surrounding town of Chester, Pennsylvania. In class, ML performed well, though he demonstrated a habit of plagiarizing that continued throughout his academic career. But he was helped by friendships with fellow seminarians and the mentorship of the Reverend J. Pius Barbour. In his three years at Crozer between 1948 and 1951, King delivered dozens of sermons around the Philadelphia area, had a gun pointed at him (twice), played on the basketball team, and eventually became student body president. These experiences shaped him into a man ready to take on even greater challenges. Based on dozens of revealing interviews with the men and women who knew him then,The Seminarian is the first definitive, full-length account of King’s years as a divinity student at Crozer Theological Seminary. Long passed over by biographers and historians, this period in King’s life is vital to understanding the historical figure he soon became. Patrick Parr has written about Dr. King for magazines and newspapers such as the Atlantic,Seattle Magazine, and the Japan Times. He worked as a historical consultant for the New Jersey Historical Commission, helping to decide on nominated Martin Luther King Jr. landmarks. In 2014, he was awarded an Artist Trust Fellowship. David J. Garrow is the Pulitzer Prize–winning author of the King biography Bearing the Cross and Rising Star: The Making of Barack Obama. "King's three years at the Crozer Theological Seminary, south of Philadelphia, marked an important turning point in his life and are well worth the exclusive focus they get in this compact, readable and well-researched book." "More than anything else, it's Mr. Parr's willingness to dig that impresses and makes The Seminarian an original, much-needed and even stirring book about King's formative years at Crozer...Mr. Parr deserves credit for leaving no page in King's academic record unturned." "Parr is a wonderful guide through this pivotal season of King’s intellectual development, spiritual formation, and youthful angst. We feel the young seminarian’s anxiety as he arrives at a predominantly white school, we witness his encounters with the North’s less flamboyant but equally treacherous brand of racism, and we experience the heartbreak of his short-lived romance with a white student... Grounded in exhaustive, primary-source research, the narrative bounds forward with an energetic curiosity that resembles the bright and restless spirit of its young protagonist." 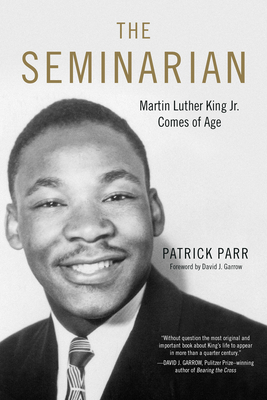 —Clayborne Carson, editor of A Call to Conscience: The Landmark Speeches of Dr. Martin Luther King, Jr.
"Concern about such whitewashing is part of what motivated Patrick Parr to write The Seminarian...Parr has done some impressive digging in the historical record and there is no doubt that scholars writing about King will find The Seminarian useful. The book should also attract students and faculty at seminaries and divinity schools, who will be interested not only in the particularities of King’s experience at Crozer but also in the fascinating picture that emerges of a mid-20th-century theological education." "The Seminarian is a clear-eyed and honest account of some transformative experiences in the life of the gifted young man who would become a cultural icon." "Historian Parr's debut work of nonfiction is a true life bildungsroman...Often overlooked or relegated to mere footnotes in previous biographies, Parr highlights this short, influential period in King's life, fleshing out the details of courses, teachers, mentors, pals, and dates, and presenting a fresh portrait of King, the 'rookie preacher.'"